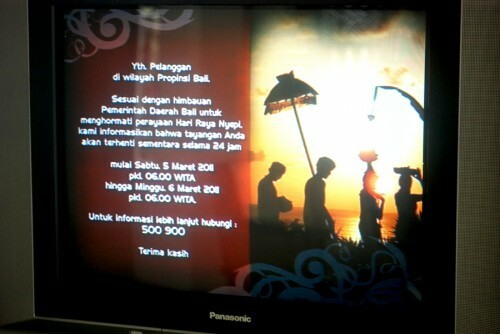 It’s Nyepi, and we’re not supposed to light the stove. No flames today. No incense. No smoke. No offerings. No prayer. Yes. We are cheating. Strictly speaking no food, hot or cold. No pulling out dishes, or washing them, or putting them away. They’re not supposed to know we’re here. The spirits. The ones we chased away last night. If we’re really really quiet they’ll think no one lives on this island and then they’ll go away until next year. That’s why the airport is closed. And the roads are empty. We have to stay inside or we’ll blow the secret. I’m going to go read then. No reading either. In fact, no writing, no blogging, no television, no radio, no Facebook, no Twitter, no phone calls, no texts. They’re mind readers, so try to make your mind still. Later tonight, no lights either, but you won’t mind because what do you need light for when you’re gazing at a trillion stars? But you’re still going to eat? I’m cheating, I told you. It’s just rice and beans. 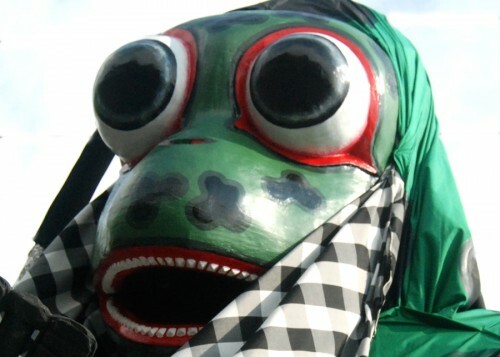 I eat rice and beans on Nyepi. Feels yoga-ey, Hindu-ey. Feels good to gives the animals a break. Heat the oil over medium-low heat in a 2- to 3-liter, heavy-gauge saucepan. Add the onions and cook and stir until they soften, about 1 minute. Do not brown the onions. Add the cilantro and continue cooking and stirring until the leaf’s aroma wafts out of the pan, about 30 seconds, then stir in the dry lentils and cook and stir until they start to sizzle, about 2 minutes. Stir in the boiling water and tomato paste (be careful to avoid a steam burn) and simmer the lentils, covered, for 15 minutes. Remove cover, season with the Garam Masala and salt, and continue cooking, uncovered, until lentils are soft and resemble a loose purée, about 5 to 10 more minutes, depending on the size of the dry lentils. Adjust seasoning as desired and remove from heat. 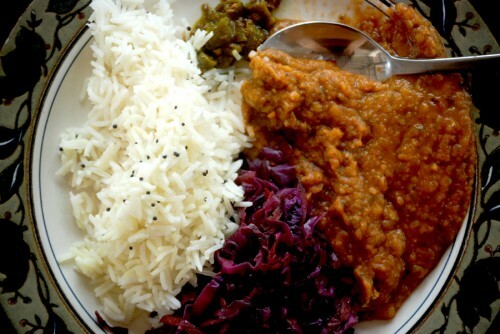 These lentils are served above with basmati rice, seared red cabbage, and a green chili chutney. *Garam Masala is a blend of dry, powdered spices available in specialty food stores and Indian grocers. You can also grind your own. Charmaine Solomon has excellent recipes in her tome, The Complete Asian Cookbook. ~ Bobby, March 11, 2011 at 1:37 pm. I love Nyepi and your recipe is the best!!! Great to see your blog. I’ll be checking! ~ Jan Link, March 18, 2011 at 5:03 am.